The Clemson Design Center is opening in the Cigar Factory in Charleston. CHARLESTON — This fall semester, the new and the old finally are coming together as Clemson University’s architecture and historic preservation programs in Charleston are united under one roof in a new space at the Cigar Factory on East Bay Street. The former cigar and textile manufacturing plant, built in 1881, is on the National Register of Historic Places. The programs in the newly renovated facility will be known as the Clemson Design Center. Until recently, the two programs — architecture and the historic preservation, the latter of which is jointly run by Clemson and the College of Charleston — were housed in three separate locations. 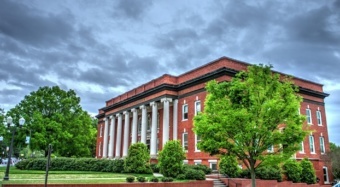 To better meet existing needs, anticipate planned growth and ensure that Clemson students in Charleston have all the resources they need, a larger, more functional facility was required. Architecture and historic preservation students will work together in the space. Clemson joins an already diverse group of tenants at the location, including Garden & Gun magazine, tech companies, high-end retail shops, restaurants and offices. The new Clemson Design Center will include studio space, classrooms, seminar rooms, laboratories, library, multipurpose space, shop spaces, faculty and staff offices. The center will either immediately or eventually include an expansion of Clemson’s undergraduate and graduate programs in architecture and landscape architecture, a graduate program in Architecture + Health, an expansion of the Center for Health Facilities Design and Testing (in conjunction with the Medical University of South Carolina) and a proposed new master’s degree program in urban design. The historic preservation program will share space in the building. With an abundance of collaborative working space and natural light, the center will feature state-of-the-art architectural conservation and microscopy laboratories through which student teaching and research will be able to explore new methods to care for historic buildings. The South Carolina Chapter of the American Institute of Architects, Trident Construction and McMillan Pazdan Smith sponsored an official ribbon-cutting for the facility.